Legion of the damned unleashed their first thrashing metal storm on the 6th of January 2006. "Malevolent rapture" was an uncompromising slab of killer death/thrash reminiscent of the masters of the eighties packed in a modern killer sound by Andy Classen and received many killer reviews in the press. The band showed to be able to combine furious thrash mayhem with mid-paced neckbreaking rhythms, trans locating the realm of the eighties into the new millenium. Since "Malevolent rapture" the band has been destroying the stage on the No Mercy Festivals together with Cannibal Corpse and Kataklysm, and playing festivals such as Rockhard Festival, Summerbreeze, Up from the ground and Wacken open air, as well as a minitour in September 2006 with veterans Destruction in the Netherlands. During the No Mercy Festivals Harold Gielen joined the band on bass, increasing the ferocious power of this well-oiled warmachine on stage. Between the gigs the band was busy writing new songs for the next album. Legion of the damned returned with "Sons of the jackal" in January 2007, featuring 10 songs that surpass the previous material, more dark, more violent and more diverse but still delivering the razorsharp riffing with utmost precisions, tight as hell drumming by Erik Fleuren and hateful vocals by Maurice Swinkels which sound even more menacing and vicious than before. The production by Andy Classen at Stage one studio outdoes the job on the previous album. That Legion of the damned know the tools of the trade is displayed in the violent hammering of "Sons of the jackal", the devilish anthem "Diabolist", the primitive stomping of "Death is my master", the sinister mid-paced power of "Infernal wrath" or the fast Kreator style butchery in "Avenging archangel". The album "Sons of the jackal" even made it to the official German album charts on place number 54. After a successful tour with Kreator and Celtic Frost, and so, intensively playing shows all across Europe in 2007, in 2008 Legion of the damned released "Feel the blade", a re-release album from their previous band Occult's "Elegy for the weak", the album got superb reviews in all major magazines across Europe and not even entered the official album charts again in Germany, but also in Finland, Norway and Austria. "Feel the blade" got officially released in South America by NuclearBlast, Finland by Stay Heavy Records, North America by Season of mist , Norway by Indie and in Japan by Spiritual beast Records. 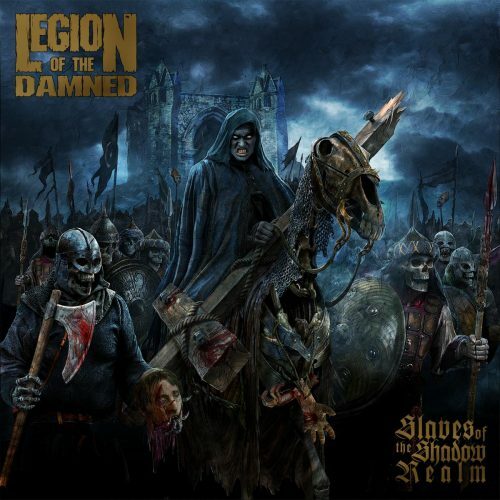 Legion of the Damned is entering the studio to record	"Ravenous Plague"